To go to the picture gallery of this special report click here There is no doubt that God’s divine favor was opened to Kayode and Olumide on their trip to the city of Kiev, Ukraine. The nation of Ukraine is comprised of about 50 million people. Though not a rich nation, it is a place that is experiencing the revival of souls. Olumide and Kayode Taiwo were privileged to see it firsthand. They both concluded that the revival taking place through The Embassy of God led by Pastor Sunday Adelaja, is the result of the prayers of the saints who have prayed for years that the grip of communism would give way to a supernatural invasion of God’s spirit. What is more significant is the fact that Pastor Sunday is a Nigerian in Ukraine who leads a 20,000 strong church (the largest charismatic church in Europe). The Embassy’s central church has more than seven thousand in attendance every Sunday in the city of Kiev, and 27 branches in the same city. The central as well as the branch churches all meet together once a month for a special service that comprises of 20,000 members in attendance all at once. Olumide and Kayode went to Ukraine on the invitation of Pastor Sunday Adelaja (seen on the right) . They were warmly received by Pastor Sunday and enjoyed both fellowship, mentorship, impartation, as well as an opportunity to minister at The Embassy’s central church. They also ministered at a couple of their branch churches known as “daughter churches” in Kiev, Ukraine. They were also privileged to meet Bishop Abraham Bediako (seen at the top of the page with Kayode) who pastors in Hamburg, Germany. 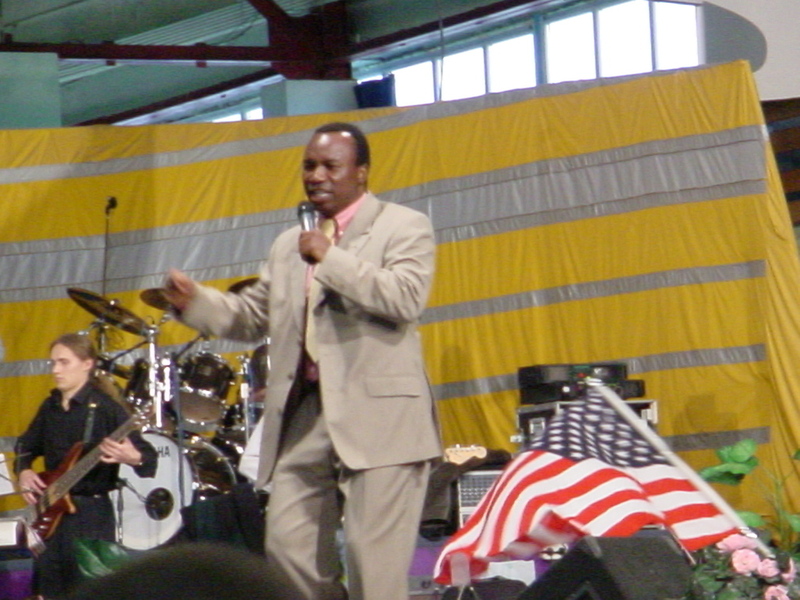 Bishop Abraham has a number of churches under him. They also met a Swedish delegation. They gave Kayode and Olumide an open invitation to Sweden. Kayode and Olumide got an opportunity to address businessmen and women of The Embassy of God. They stressed to them the need for having a vision. Kayode emphasized the difference between having a purpose and having a vision. “Purpose is what you exist to do, while vision is what you see….” He explained that there is a need to have a God-given vision for one’s purpose in life. Kayode and Olumide also visited a prayer site where they met several women geared for prayer. They got to introduce themselves and learn about the women’s prayer focus for that meeting. They were praying solely for their sons to be saved and delivered. The nation of Ukraine struggles with the problem of alcoholism and illicit drug use. This is a problem that The Embassy of Godtackles; the church has a good success rate in rehabilitating drug addicts. Kayode and Olumide saw firsthand as many men came up to testify of their freedom from the snare of drug addiction. The staff of The Embassy of God also received Kayode and Olumide very warmly. In fact, they were informed that they were the subject of a church announcement as they were the first twin guests to ever visit The Embassy of God. One of the more notable things was their first meeting with Pastor Sunday Adelaja. As Kayode and Olumide drove with him he did not start out by sharing stories of his successes (and there are many of them to tell). Rather he shared about the vicious attacks on his person that permeated the newspapers of Kiev as they were not use to the move of the spirit. The majority of professing christians in Ukraine are of the Orthodox church. At the thursday night service, Pastor Adelaja introduced Kayode and Olumide to about 5,000 people in attendance. They also met a delegation from Pretoria, South Africa and gave them a copy of their book The Progenitor Principle: Why You Must Leave A Legacy behind. On Friday, Olumide gave a clear charge to the men, explaining to them that according to Genesis 1: 26 the word ‘image’ means “representative figure.” This means we are ambassadors representing God here on earth. During that same service Kayode followed with a powerful exhortation on the life of Joseph. He went on to explain that the ‘immature Joseph’ received the dream, but the mature Joseph fulfilled it. He told the crowd of men that there is a subtle difference between an ambition and vision. An ambition is a human drive to succeed, while a divine vision is of God and is characterized by a redemptive quality. They also addressed the men again on Saturday. Olumide taught on our origin in God and how it affects our destiny. On Sunday, the last day of ministry in Ukraine, Kayode and Olumide ministered at different branches of The Embassy of God in the city of Kiev. Each branch where they spoke numbered about 200-300 people in attendance. Overall, Kayode and Olumide were in awe of what God is doing in Ukraine and the opportunity to see it firsthand.